File data is stored distinctly from its name and can be referenced by more than one name. Each filename, called a link, points to the actual data of the file itself. In order to support links for each file, the filename is separated from the other information that describes a file. 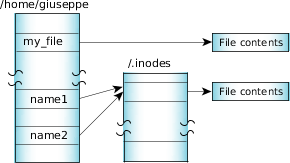 The non-filename information is kept in a storage table called an inode (for "information node"). If a file has only one link (i.e., one filename), the inode information (i.e., the non-filename information) is stored in the directory entry for the file. If the file has more than one link, the inode is stored as a record in a special file named /.inodes—the file's directory entry points to the inode record. Figure 1. One file referenced by two links. Note that you can create a link to a file only if the file and the link are in the same filesystem. If a file's filename is longer than 16 characters, the inode information is stored in the /.inodes file, making room for a 48-character filename in the directory entry. Filenames greater than 48 characters are stored within a .longfilenames file, which has room for a 505-character name; a truncated 48-character name is also placed in the directory entry, for use by legacy systems. If a file at one time had more than one link, and all links but one have been removed, the file continues to have a separate /.inodes file entry. This is done because the overhead of searching for the directory entry that points to the inode entry would be prohibitive (there are no links from inode entries back to the directory entries).